Amazon Echo vs Google Home: which is the smart speaker for you? Let the battle of the smart speakers commence! If you're in the market for a smart speaker, then you're going to have to weigh up the Amazon Echo vs Google Home question: how do you split two of the best devices out there? Well, hopefully we can help. As you would expect from two of the biggest names in tech, the Amazon Echo and the Google Home are both very polished smart speakers, and neither would look out of place in your home. Amazon Alexa and Google Assistant are both maturing and becoming more useful with every passing day too. Both the Amazon and Google smart speakers (and their assistants) let you get answers to questions, set timers and alarms, control smart home devices, and much, much more – all with spoken voice commands. The Amazon Echo and Google Home devices have a lot in common then, but they are also some key differences to talk about. You need to be aware of what you're getting before you part with any of your hard-earned cash. We know that the smart speaker is at the center of most smart homes: but is the Amazon Echo or the Google Home right for you? Let's dive in. Is Alexa better than Google? That's a tough question because they're both similar and we find it difficult to pick between the two. Which one you decide to go with may well depend on which you personally prefer and what kind of products you're using than which is technically 'better'. Having said that, Alexa tends to be better when it comes to support for a wider range of devices, as well as better smart home integration. So if you have a lot of smart home devices already, Alexa might be your best bet. However, lots of users who have put the two devices head-to-head believe Google Assistant could be the smarter of the two. And, with Google's A.I. learning experience, it has the biggest potential for the future. Is there a monthly fee for Echo? No. You don't have to pay anything extra after you've purchased an Echo product. Although you do get some perks if you're an Amazon Prime member, like access to Amazon Music. Can Alexa drop in on Google Home? No. Alexa's Drop In feature only works with other Alexa-enabled devices. What's the difference between Echo and Google Home? As we've said above – very little right now. They're both very capable smart assistants that respond to voice commands and work well with many smart home devices. Read our full head-to-head below to get a better idea of the specifics. Let’s kick off with the smart speaker that started it all. Back in 2014, Amazon launched the Echo, and it's now up to its second generation model: standing 148 mm tall and sounding pretty decent for its price, with Bluetooth and Wi-Fi connections supported, it's an impressive bit of kit. It also features that signature blue ring around the top telling you when it's heard the "Alexa" wake word. Perhaps the most popular Echo of all though, and one of our favorite smart home devices full stop, is the Echo Dot – that's likely because it’s the cheapest of the entire bunch and is about the same size as a hockey puck, making it a no-brainer for those who want to try smart home tech for the first time. Now in its third generation, the Echo Dot doesn't have the best audio quality in the range, so it's best suited for rooms where music playback won’t be its primary function. That said, you can pair it up with a Bluetooth speaker or another audio device using an AUX jack connection, making it a cost-effective upgrade you can make to any aging Hi-Fi system. Then there's the pricier, 2nd-gen Echo Plus: slightly taller than the vanilla Amazon Echo, with improved sound and integrated smart home hub features – meaning it can be more tightly integrated with the various other bits of smart home kit you've got installed. And what about the newly upgraded Echo Show? It's essentially an Amazon Fire tablet with an Alexa-enabled speaker built in, so you can get Amazon Prime Video or the weather forecast up on screen as well as having responses read out to you. It's a perfect gadget for the kitchen (think recipes and video watching). The other smart speaker in the Amazon Echo line to come with a screen is the Echo Spot, which you can think of as an upgraded Echo Dot – this Echo is perfect for a bedside table, with the ability to make video calls through its circular screen. All of these devices have access to the majority of Alexa's skills (think voice-controlled apps) available, though only the Plus can truly double up as a bridge for your smart home devices – while all Echo products can talk to things like smart bulbs and thermostats, it’s only the Plus that lets you do away with individual hubs for each additional gadget family. 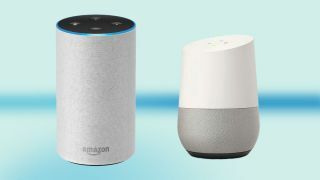 Google's smart speaker range is a little smaller than Amazon's, with four Google Home speakers to choose from, including the recently unveiled Google Home Hub – the only one of the range to feature a screen. The smallest of the three is the Google Home Mini speaker. Like the Echo Dot, the speaker is puck shaped, if a little more pebble-like with softer edges, and has a top side covered in a fabric speaker mesh. You can pick up the Google Home Mini in a range of colors, with four flashing LED lights illustrating when it's listening to your commands and showing the volume level. In the middle of the range taking on the Amazon Echo devices is the standard Google Home speaker, which looks considerably different to the Mini. It has the appearance of a small vase, with a two-tone color design (multiple shades are available here too) and a sloping top side that houses a touch control panel. The Google Home Max, meanwhile, looks much more like a traditional loudspeaker, and is the largest of the bunch – it doesn't really have an equivalent Amazon Echo device either. It's boxy in design, closer aesthetically to the Google Home Mini (with the mesh speaker covering), and can stand in either a portrait or landscape orientation to suit the space you've got. While the vanilla Google Home is an acquired taste in terms of design, both the Mini and Max are subtly attractive, and should fit into any surroundings without much concern. And lastly that Google Home Hub, unveiled in October 2018, and taking on the Amazon Echo Show directly. It can show videos, the weather, recipes, music artwork and so much more, but it doesn't have a camera – so video calling is out of the question. Keep in mind that, with both Alexa and Google Assistant, third-party speaker manufacturers are increasingly choosing to integrate the voice helpers into their own products. So, if there's an audio manufacturer you're particularly fond of, it may be worth holding out to see if it has any plans to join either of the smart ecosystems – at this point, it's highly likely that most all audio devices in the near future will come equipped with some sort of microphone and voice control system. The smart features of the Google Home and Amazon Echo lines are broadly similar – speak to them, and you’ll be able to do anything from playing back music, having general knowledge questions answered, controlling smart home gear, and setting alarms and timers... and that's just scratching the surface of the Amazon Echo vs Google Home debate. Both Google and Amazon are committed, long term, to improving their respective voice platforms, and each has done a good job so far of enticing third-party smart device manufacturers – from thermostat makers to smart lighting companies – to make their products compatible with each service. With a base level of commands available to each, with either a "hey Google" or "hey Alexa" wake command, control of the digital world is just a vibration of your vocal chords away. Amazon Echo and Google Home speakers do take a slightly different approach to the way their abilities are accessed. Google Home's abilities are, by default, accessible to all – barring pairing up third-party smart home devices with your Google Home system, if you've made a request that the Google ecosystem can understand, it'l carry out the required response unprompted. Alexa, on the other hand, relies on the installation of skills – individual, app-like sets of related voice commands focussing on certain topics or abilities. Handled and activated through the Alexa app on smartphones, these can range from getting information on local transport times, or to activating voice-controlled games. There's no right or wrong approach really – Google's is simpler, but Alexa's encourages faster and broader development and support from third-parties. As you'd expect from such a wildly varying range of shapes and sizes, you get very different sound performance across both ecosystems, let alone when comparing Amazon Echo against Google Home in general. Here's a broad breakdown of how they sound in relation to each other. If you can only afford the entry-level devices, and music remains a top priority for you, go for the Google Home Mini, which sounds a lot better than the Echo Dot. Unless you hook up a Dot to another speaker over Bluetooth or the 3.5mm jack, it's just too thin and harsh to fully enjoy. If you're looking for a small Echo speaker, your best best then is the Echo Spot, which despite its size offers a richer sound. The screen, however, massively increases its expense, so bear that in mind. As you move up the size scale, the Google Home is too bass-heavy to be truly enjoyable. It also has worse clarity than the latest generation of the Amazon Echo speaker and the Echo Plus. So, if you're limited to around $100/£100, the Amazon Echo may be the best choice from an audio perspective. With a slight premium in price, and the inclusion of Dolby processing, the Echo Plus sound is more dynamic than the standard Echo, as you'd hope. And, despite its looks, the Echo Show sounds better than the Echo Plus and Echo, though not so dramatically as to forgive it some of its other failings. If you're going for pure sonic superiority between the Echo and Google Home ranges however, opt for the Google Home Max. Its bass is well tuned, its mids and highs well defined, and its top volume levels loud without verging into highly distorted territory. There's such a range of prices across the two speaker platforms that, in fairness, there’s something for every wallet size when it comes to the question of Amazon Echo vs Google Home. It's more about what you’re expecting to get from your smart speaker of choice: Amazon, offering the widest spread of options, hits both the most affordable and expensive price points between the two brands, with the Echo Dot at the lower end and the screen-packing Echo Show at the top. Google, on the other hand, sits somewhere in the middle. You can compare the latest pricing between the ranges below. There's no easy answer to the question of whether you should go for Amazon Echo or Google Home as your smart speakers of choice. Both lines are very accomplished and, so long as you temper your expectations in line with the amount of money you're going to spend on buying into one of the lines, all sound good enough for their respective price points. The choice really then comes down to the preference of ecosystem as opposed to the hardware. Are you heavily invested in Google's services? Then Google Home is probably for you, as the two areas are only going to become ever-more-closely linked. Google's natural language understanding is superior too, even if its voice implementation still needs some refinement. However, in terms of sheer value for money and the already vast reach of its collaborations and abilities, Amazon's Alexa devices seem the more sensible bet at this stage. It’s a close run race, with Google's powerful search capabilities potentially seeing it through in the long run. But there’s something to be said for Amazon’s more focussed approach – from our experience so far, Alexa currently feels like the more reliable assistant. But that could change. Either way, place your bets – you're unlikely to come away disappointed whether you opt for an Amazon Echo or a Google Home smart speaker.